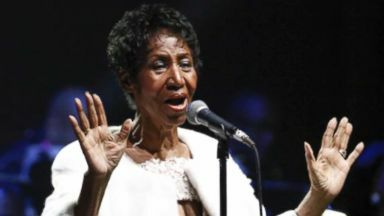 Family and friends honored the singer and celebrated her life in a star-studded funeral and concert. Rorter: It was a home-going fit N. ?????? 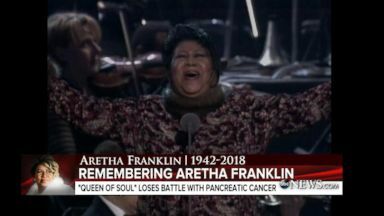 Reporter: Aretha fr her heavenly journey eulogized. 'Re going bene of the featured voices in choir O angels.ow, you'd have to ??? I'll miss you ??? Reporter: And saded by her fries. ??? And you'll neveralk alone Reporter: Musical legends in their own right. ??? Godless areth Reporter: Tributes paid by heads of staast and prent. And adoring fansdi H in perhaps the way in a resident pcession of pink caacs. A black woman in a whman's world it's te to crown the queen! Reporter: In her Bel hometown of detroit,michigan ousands gathered in honor O the original diva. ??? You mak meeel lik natural woman ?? ?order: Throughout her ade career, she S for royay and inaurated presidentsod bless ACA Secret of her greatne was she T this massivetis perfect culture that raised her and decided be the composer of herwn life song. And what a song it Tur out to be. Repr: Frankli died earlier this month at the age 76, log her battle with pancreatic ncer. But as so many pointed ou througher life, her family, and that indelible music -- ??? J Rep he was classy enough to sin the prominent stages in thworld. But she was rl ugh to make potato salad and se chicken. 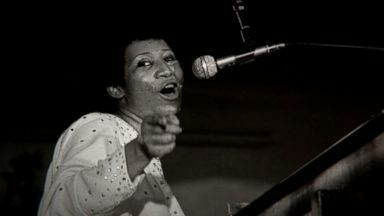 So if shes the queen of soul,very time she sang, she sarom her soul. She sanghis scial place that was in her soul,e it gospel, be it jazz, bet blues, be it r&b, it was always from her so. Reporr: Perhaps one of the most touching ttes com from one who knew her best, her granddaughter victory. Respected. I have that running through my blood, and that she's a P of who I am. Orter: And her grandson an. I'm sad today because losing my friend. Showed the world god'sove there's nothing more norable. Reporter: To her family, a and tivist.ll of life, she supportedhecauses. She was a feminist before minism was she wa civil rightst when it wt popular. And that's WRE all here. We don't all agr on everythingwe agree on arethaeporter: Many calling her music the soutrackf the civil rights vement. ??? R-e-s-p-e-c-t the height of the civil rights moveme outith song where you're spellint r-e-s-p-e-c-t. It moved theiv rhts movement. Pe mched tohat music. LE asked F respect.y, guratively theoretically. And she was centra that. Reporter: Her legac indaerg her to dignitaries, to former presid George W bush and Barack Obama paying he from af May T almighty comfort in your grief and sin you during this difficu time. Laura and I send our heartfelt symp. God you. George. Bush. 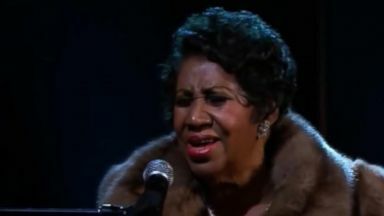 ING a little prayer for you,nd we'll be thinking of all of Aretha lovednes in the days and wks come. Sincerely, Barack obam prest of the united states.r: 17 open hits. 18 awards. The numbers tell you everything and G. Becauseretha frin's voice was as much aons a rainbow. Something of impossible beauty and of thisworld. ?? ?Hink that going to let yourself be free ??? Reporter: Ch greatnpiring her activism, empoweng so many. ??? Oh fre F freedom he's probably, you know, themost influential vocalist O the last 40 ??? looking out T pouring rain ??? Reporte those boong vocals heard on radio, big arenas- breaking barriers on T sma screen. Franklin was on televisi bng a black womanen we did see that M of them at all. Thwas no shonnd, there S no "In living color," none hat was happening. We had to grabt images to try to putogether like we it out. Arha wascentl. Reportoday's ceremony capping a week of tributes Wright her body cried in E ivory 1940 cadilla hears that brought her father legendary minister Franklin, and civil rights I ra parks, to their fin restingplac. Mourners lined up to P their O a diva the end. In a tedasket surrounded by roses. Franklin dressedn red allhe way down to toll low toes, ankles gracefully crossed. This the first of wt would be four wardrobe changes before was ld torest. Last night more than 40 ATS gathering to salute the life of end. ??? You you you ??? R pat Labelle performing "You are myfriend od marathon nearly eight- fare, Hollywood glamorschool gosl. ?????? ??? I Wil keep you perfe peace ??? ??? Reporter: Astar-studded cr in their sundaybest. A tapy of that rocked indues changed litics. Whoopigoldbe. Tyler Perry. Jennifer lewis.ong the famous faces who C to P their ects. She took theifts her, and she kept getting a ton front and center reminding the audnce tonk about Fran's enormous ??? you better T think about at you're trying to O me ??? Thi T you'rengo let yourself beree ??? It's the key to freedom. God bless you, ha, wee you. Sheed the in ou community, and she for ourommunity until the D.eporter: A today her counity sho up T celebrate the daugh Baptist preacher whoseringareer never lost sight of its gospel roots. ?????? Rep the music worthy of the occasion with Gladys knight. ??? He my living ??? Reporter: The clarkesisters. I'm going to come out of myshs. Ror fantasia kicking off hhoes during a gospel overture. ?????? and a pops with a soule. Ariana Grae beltingut "You make me F L a nature woman." Make meal a nature woman ??? Reporter: Cly Davis reflecting on over decades so privileged to B and rsonally wness a mnitude of talent of this singer's singer mucian's music Reporter: The service N only a celebration of life C, but a testament to Frankl's long history of acsm. We thaer for what D with Dr. King. Her F what she's done witheverend Jackson. Wenk for what she's done with all O us. She had money aou buy iceam. Had car and could not S Y gasoline. Aretha ce out of bowels of our struggle. In T, her status as a queeunlike others whoerit a title, her title was earned. ??? Amazing ??? Reporter: Her royal highness, the DI queen of soul, ??? alw been lovi you forever ??? 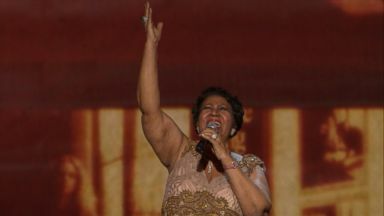 Remembering the life of Aretha Franklin, who passed away at her Detroit home. ABC News' Kendis Gibson reports. Smokey Robinson reflects on his favorite memories with the "Queen of Soul." As the icon battles an unknown illness, singers, actors, activists and politicians from all walks of life are wishing the singer well. 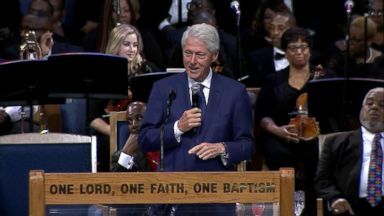 Bill Clinton, Smokey Robinson and other stars honor the late diva in Detroit. The funeral for the Queen of Soul will be held today, and the ceremony and processions are expected to last more than six hours. ABC News Zachary Kiesch reports. 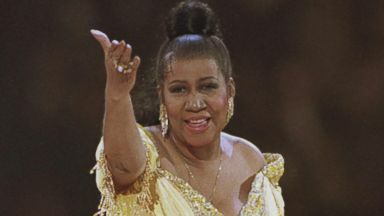 There are special tributes throughout the weekend in Detroit as well as new details on funeral plans for the "Queen of Soul."